Betta splendens are native to freshwater environments located in Southeastern Asia and more specifically in countries such as Thailand, Vietnam, Cambodia, Burma and Laos. In their natural habitat, betta fish live in environments with very thick vegetation, low dissolved oxygen concentrations, high, stable temperatures, and shallow, slow moving waters. Such environments include: shallow rice patties, overgrown ponds, and polluted streams. (Sturgeon, 2001). Betta splendens are in the suborder of Anabantoidei. One characteristic of this suborder is that they are considered a labyrinth fish, meaning that they have a special labyrinth organ. Since betta fish thrive in what may be considered harsh conditions of oxygen-poor, slow moving waters, they must have adaptations to this sort of environment. This special labyrinth organ allows the fish to gulp air directly from the environment by just going to the surface of the water (Purser, 2007). This is easy for the betta since they live in such shallow environments. Another characteristic of their environment is the temperature. In Thailand the average temperature year round is approximately 75ᵒF. To see in interactive map of Southeastern Asia and the betta fish's habitat click here. Betta fish need their environments temperature to be around this to maintain their metabolic processes. At temperatures below 70ᵒF betta fish enter a state of very low activity because of the slow pace of their metabolic processes at this temperature. For the other end of the betta’s metabolic rate, at temperatures above 81ᵒF, their metabolic processes move extremely fast and process biological wastes too quickly. This accelerated metabolism throughout the body also causes the fish to age more quickly than in its preferred temperature in the mid to upper 70’s (Purser, 2007). These are just a few examples of adaptions due to the habitat that the betta fish lives in. Because of these highly specialized adaptions, betta fish must have these environmental factors in order to survive. These factors again include: shallow waters, low dissolved oxygen concentration, high, stable temperatures, and slow moving waters just to name a few that bring the betta fish habitat into a well-functioning environment for this organism. However, these environmental factors sometimes get altered from the natural conditions because these fish are also kept as pets all over the world. This aspect gives this fish another type of habitat other than its natural one. 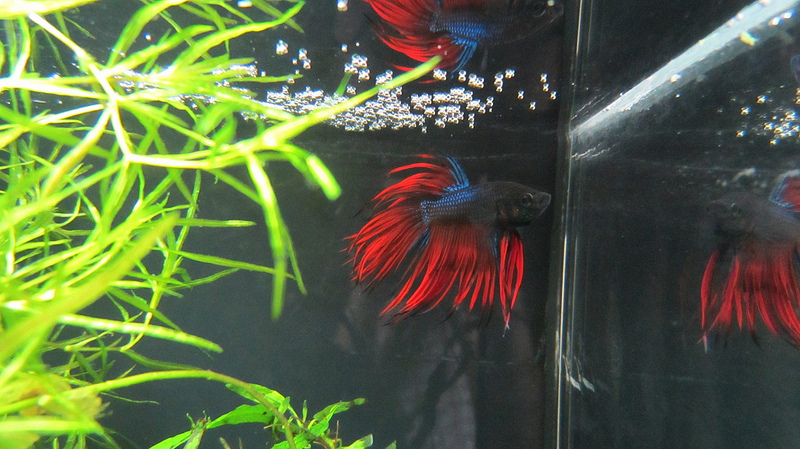 Betta splendens are also a well-known domestic fish. Domestication of these fish began in Thailand in the 1800’s. Since the betta fish were well known as being aggressive and very territorial, these fish were originally domesticated and bred for competitive fighting (Campbell, 2013). Although these fish are common pets, they are losing their natural habitats. Over the last 20-30 years, the natural habitat of betta fish have been greatly decreasing in ponds, rice patty fields and other common locations for these organisms due to urbanization and industrialization (Monvises et al., 2009). Let's dive into how the betta fish has adapted to it's environment. Click here to continue.